The town of Tivoli, the ancient Tibur, lies 30 kilometers east of Rome in the Sabine Hills, beautifully set on a limestone ridge above the ravine carved by the River Aniene. During the Roman Empire, it was a favorite resort of nobles and the Emperor Augustus himself, who sought the cooler air of the hills as an escape from Rome's summer heat. Although Tivoli is mainly known to tourists for its two blockbuster attractions - Hadrian's Villa and Villa d'Este's gardens - the town itself has a medieval castle and several interesting churches. One of these, San Francesco, is the starting point for a procession on August 14 each year, when a venerated image of the Virgin is paraded through the streets. The magnificent complex of buildings and gardens, built in the second century AD by the widely traveled Roman Emperor Hadrian, covers an area of 120 hectares. Hadrian tried to reproduce here in full size some of the places and great buildings he had seen in his travels, especially those of Greece and Egypt. He had some of the finest Greek sculptures reproduced, and many of these are in Rome today, long after the Greek originals have disappeared. In inscribing it as a World Heritage Site, UNESCO described it as combining "the best elements of the architectural heritage of Egypt, Greece, and Rome in the form of an 'ideal city'." Today, most of this open-air museum of the finest second-century architecture lies in ruin, but in such a scenic green setting that it seems more like a romantic garden than an archaeological site. A few buildings have been repaired or reconstructed, but to appreciate what the complex looked like, begin by seeing the model near the entrance, then explore the grounds and the remains of the imperial palace. You'll find mosaics, baths, a nymphaeum, fountains, colonnades, statues, and the Maritime Theater - a pool with an island where Hadrian escaped the pressures of government. Often cited as the definitive example of Italianate gardens, the vast Villa d'Este estate has been the model for gardens all over Europe. Don't expect to run quickly through, as this is not just one garden, but a whole series of them, highlighted by statuary, elaborate fountains, water play, pools, cascades, grottos, and terraces with spectacular views across the Roman Campagna. From the time he arrived as Governor of Tivoli, Cardinal Ippolito d'Este, a member of Ferarra's most prominent Renaissance family, set to work planning the grounds to surround the governor's villa. The layout was unusual for its time, a long central alley intersecting with paths to the major fountains, each set against the surrounding landscape to seem like its own garden. Among the garden's highlights are the elaborate Fontana dell'Organo with its water-powered organ, the Cento Fountain - a long row of fountains in a stone wall, Fontana dell'Ovato with its cool walkway behind a waterfall, Fontana del Nettuno, and the Gran Loggia, where the cardinal and his guests dined overlooking the gardens. When Cardinal Ippolito d'Este became governor of Tivoli, he immediately set architect/artist Pirro Ligorio to renovating the governor's palace, in a former Benedictine monastery, to his own taste. Some of the brightest lights of late Roman Mannerism -- Girolamo Muziano, Livio Agresti, Durante Alberti, Federico Zuccari, Cesare Nebbia, and Antonio Tempesta -- decorated its rooms, which were almost completed, along with the gardens, by the cardinal's death in 1572. Although some of the original wall paintings have been lost, many remain, along with nearly all the elaborately painted ceilings. A row of fountains along a corridor lit from the main courtyard was designed by Ligorio so the cardinal could enjoy them even in bad weather. Be sure to see the graceful spiral staircase. The palace was later owned by Archduke Francis Ferdinand of Austria, whose assassination at Sarajevo in 1914 precipitated World War I. To the east of Piazza Rivarola, Ponte Gregoriana spans the gorge of the Aniene River, and beyond the bridge is the main entrance to the park of the Villa Gregoriana, commissioned by Pope Gregory XVI in 1835. The waters of this river are diverted through the Traforo Gregoriano, a long double tunnel cut through the west side of Monte Catillo in 1826-35 to prevent the frequent devastating floods. The water emerging from the tunnel forms magnificent waterfalls with a total drop of 160 meters. At the end of the tunnels is the 108-meter Grande Cascata, which you can see best from the upper and middle terraces. Also in the park are the Sirens' Grotto and, at the end of a gallery, the Grotto of Neptune, where the main channel of the Aniene formerly flowed. From the entrance to the gallery, a path zigzags up to the exit near the two temples. From the entrance to the Villa Gregoriana, the Via Quintilio Varo runs around the outside of the park and then along the right bank of the Aniene, past an arch in honor of the Virgin that was erected in 1955. From here, Via delle Cascatelle leads along the river with beautiful views of the waterfalls and the town. The best views are from the Belvedere and from the church of Sant'Antonio. East of the cathedral and not far from Piazza Rivarola, the Temple of Vesta sits in Tivoli's old acropolis overlooking Villa Gregoriana. The round temple with 10 of its original 18 Corinthian columns was built in the second or first century BC. The nearby rectangular temple of the same age is called the Temple of Sibyl, although it's not known for certain who either of them was dedicated to. The round temple owes its relatively good condition today to its Christianization in the Middle Ages as the church of Santa Maria della Rotonda, but any sign of those alterations have long since disappeared. 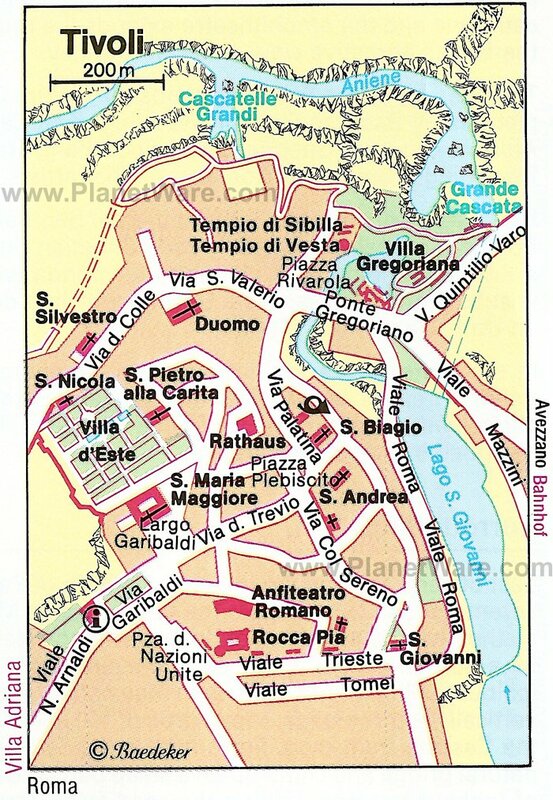 You can also reach the temples by a path from the Villa Gregoriana. Although the Latin inscription above the entrance to this formidable castle says it was built by Pope Pius II for the protection of the good people of Tivoli from their enemies, the pontiff's intentions were more to remind the frequently rebellious townspeople of papal authority. The resulting fortress, with its four round towers and thick walls, is certainly imposing. Enter it across a drawbridge for views from its ramparts. The tall square bell tower of Tivoli's cathedral of San Lorenzo that stands out above the town is from the church's rebuilding in Romanesque style between the 11th and 12th centuries. Behind the present apse, you can still see the apse of the earlier (first century BC) basilica that stood in the forum. The church was rebuilt once again in 1635, this time in Baroque style. The interior vaults and apse were painted by the Roman artist Angelo De Angelis in 1816, those in the apse representing the four saints from Tivoli. The most important - and surprising -- work in the church is in a side altar, the remarkable 13th-century wooden sculpture group Descent from the Cross. Above the altar in the Chapel of the Holy Savior is an excellent early 12th-century triptych of the Savior by the Benedictine monks of Farfa Abbey. B&B Il Giardino: high-end B&B, bright rooms, lovely terrace, excellent breakfast, wonderful service. B&B Catillo: mid-range B&B, friendly staff, large rooms, marble floors, comfortable beds. Villa d'Este Bed and Breakfast: affordable guest house, fantastic location, helpful owners, home-made cakes. OC Hotel Villa Adriana: budget hotel, sparkling clean rooms, free breakfast, scenic roof terrace.